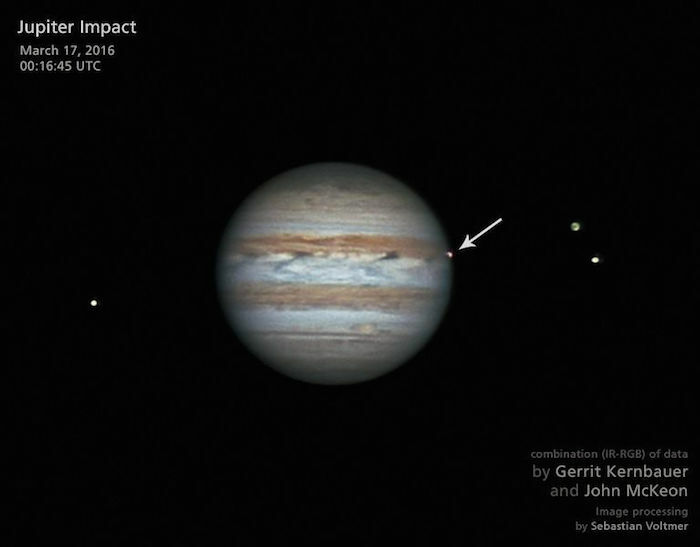 The Jupiter fireball of March 17, 2016, captured by Gerrit Kernbauer and John McKeon. Jupiter doesn't get whacked by asteroids and comets quite as often as scientists had thought. Objects big enough to generate a fireball visible from Earth — such as the spectacular one that occurred on March 17 — slam into Jupiter about 6.5 times per year, according to a new study based on the pooled observations of amateur astronomers around the world. "In three years since our program started, amateur contributors from Europe, the U.S. and Australia have analyzed the equivalent of more than 56 days of videos — around 53,000 videos — without discovering an impact," Marc Delcroix, who coordinates a group of about 60 skywatchers worldwide, said in a statement. "This is a result in itself and, together with the reports of amateur astronomer John McKeon, has helped us come up with our preliminary estimate, which slightly reduces previous estimates of the flux of impacting objects [at] Jupiter," Delcroix added. Researchers think that the March 17 event was caused by an object 33 to 66 feet (10 to 20 meters) wide. Skywatchers have observed three other such Jupiter strikes since June 2010; all of them likely involved impactors in the same general size range, scientists have said. But bigger objects hammer the gas giant fairly frequently as well. A 1,650-foot-wide (500 m) asteroid barreled into Jupiter in 2009, for example, and the big chunks of broken-apart Comet Shoemaker-Levy 9 pummeled the huge planet in July 1994, leaving dark scars that were visible in Jupiter's cloud tops for months. Nailing down Jupiter's precise impact rate is of interest to astronomers and planetary scientists as well as skywatchers. "Unfortunately, we are still dealing with the statistics of a very few number of impacts detected, but plans to improve our detection methods and perform systematic searches will help us to detect more of these objects," Ricardo Hueso Alonso, of the University of the Basque Country in Spain, said in the same statement. "That will allow us to know more about the current architecture of the outer solar system and the role of Jupiter in protecting the Earth from comparable impacts." The study team presented its results at a workshop on Jupiter for professional and amateur astronomers at the Observatoire de la Côte d’Azur in Nice, France. The workshop was organized by the Europlanet 2020 Research Infrastructure, a project designed to support planetary-science activities throughout Europe.